In your growing online community, albertapatients members continue to have important discussions about topics that matter today and in the future. There have been few subjects to gain as much attention – provincially or nationally – as the proposal to introduce Physician Assisted Death (PAD) in Canada. The Supreme Court of Canada has ruled that it must be made available to Canadians and legislation is making its way through Parliament, with hopes that it will be passed by the June 6 deadline imposed by the Supreme Court. No matter where you live, this topic is a matter of debate. There are differences of opinion among members of the public across the country. There are differences of opinion among physicians and other health professionals. How do people in Alberta feel? It’s likely there are differences here, too. Physician Assisted Death was a topic that albertapatients members asked to talk about. We developed a survey on that basis and, with this newsletter, we are releasing the interesting results. 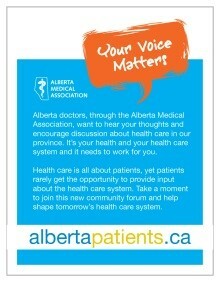 Please read on to find out what the albertapatients community thinks about this topic. I continue to be impressed with the conversations and information that you are generating through your participation in this forum. The results are thought-provoking and meaningful. We will be sharing them with the AMA Board of Directors, the members of the AMA and outward through media and social media. Let’s see what conversations arise out there. We recently asked albertapatients members for their views on Physician Assisted Death. Please read on to the Did You Know section (below) for highlights from that research and a link to the full report. • Log in to our website at http://www.albertapatients.ca/, look for the Refer a Friend box on the right side of your screen, and click the “More Info” link to tell others about us on social media. Patient views on Physician Assisted Death. Did you know? 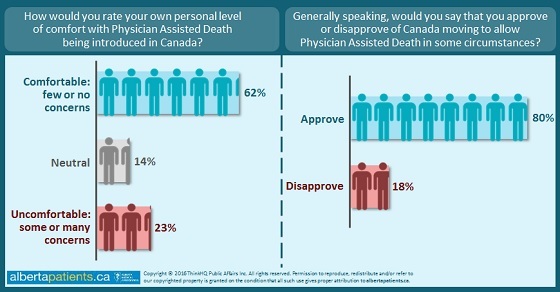 There is strong public approval for Physician Assisted Death (PAD) among patients in Alberta. More than 3 in 5 patients feel comfortable with PAD being introduced in Canada, having either few or no concerns about it, and 4 in 5 patients approve of allowing PAD in some circumstances. Views on Physician Assisted Death are influenced by gender and household composition. 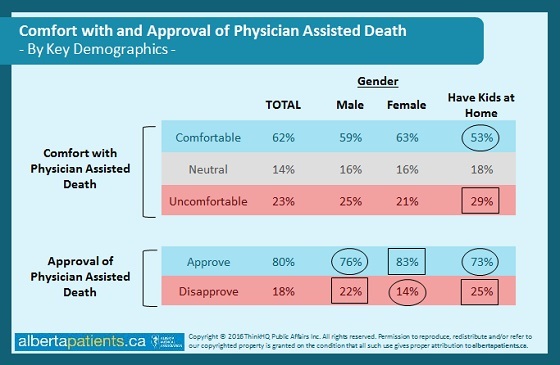 Generally speaking, more women (83%) approve of Physician Assisted Death than men (76%), and patients with children living at home have more reservations about PAD - 29% are specifically uncomfortable with the idea (compared to 23% discomfort among patients in general). When asked how much they approve of Canada moving to allow PAD in some circumstances, 1 in 4 patients with children at home say they disapprove, compared to 18% of all patients. Patients have specific views about how and where PAD should be performed. 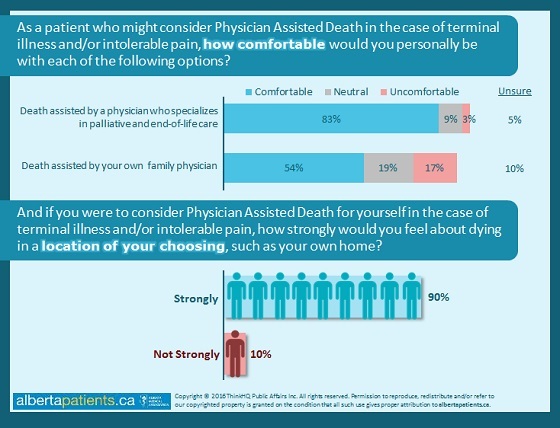 More than 4 in 5 who might consider PAD for themselves in the case of terminal illness and/or intolerable pain would feel comfortable being assisted by a physician who specializes in palliative or end-of-life care, compared to only 54% comfort with death assisted by a family physician. When asked about importance of the ability to choose their location of death, 90% feel at least somewhat strongly about dying in a location of their choosing, such as their own home.